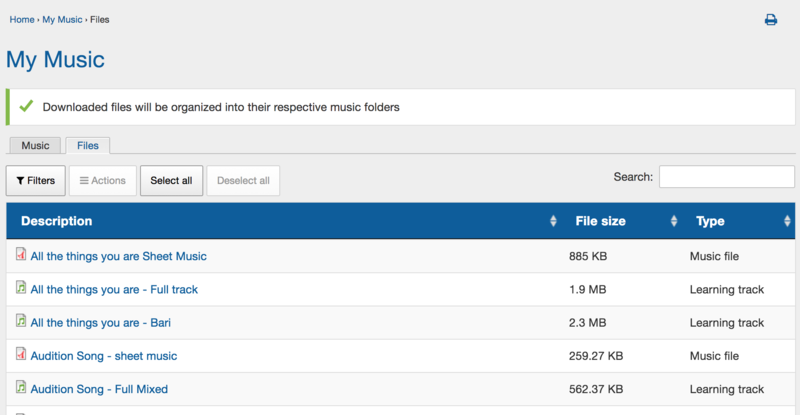 Wondering how to access music files? This page also includes information on how to download files to an iOS (apple) device, and the Playback Genius App. Navigate to the song for which you wish to download files. Do this by going to "My Music" in the main menu. On this page, you'll see all the songs you've been invited to view or learn. Use the filters or search option to find the song you're looking for. Click on the song title to access the song information. On the next page, you will see the available files for download under the heading "attached files". You can click the black and white play button to play the track in the browser. The file will load in the grey play bar below the tracks, where you can click along the bar to skip a head or back in the track. The track should be playing while you do this, rather than pausing it. You can also click on the file name to download the file to your computer. Sometimes this will only play/open the file. You may need to right-click on the link, and the select "save link as...", or choose to save the file (if it's sheet music as a pdf) after opening it. iOS devices operate differently from other mobile devices - their file system is inaccessible. this can make directly downloading files a little trickier. Often, a social browser app needs to be used. You can read more about downloading files on iOS devices here. Your Choir Genius site qualifies as a "password protected site" as mentioned in the article linked above. If you'd like to skip reading the article, this is the app it recommends (and our users have found success with it as well). You also have the option of downloading the songs while on your computer, importing them in to iTunes (Windows / Mac), and then syncing your device with your iTunes account. There is also an app specifically designed to work with your choir genius site. It's a paid app available for both Apple and Android that allows you to play your learning tracks and view your sheet music. You can Click the file names to open and save the individual files, or select the rows to select multiple rows at once. Be sure to click in the grey space in the row to select it - it will turn a pale yellow when selected. Click a row a second time to deselect it. Alternatively you can use the "select all" and "deselect all" buttons. Once you've selected your rows, use the "Actions" button to choose to download the files all at once into a zip file. 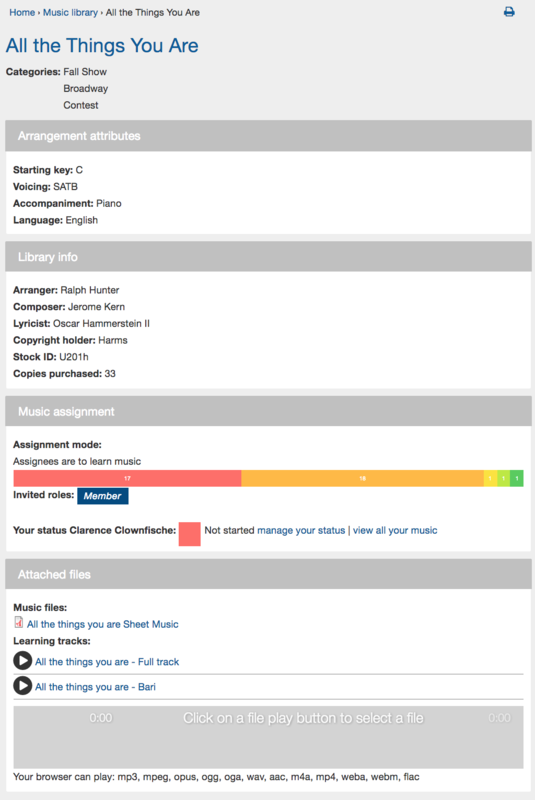 Your files will be organized into music folders (ie: if you download a learning track and sheet music for the same song, they will be grouped into the same folder). Once your zip file has been downloaded, you can open the file and then save your files to whichever location you choose, or import them into itunes.